051. CAPT. SCOTT. Issued by J.A. Pattreioux. (1929). Card number 49 from a set of 50 entitled "Builders of the British Empire". Size: Ca. 2.7" x 1.42". 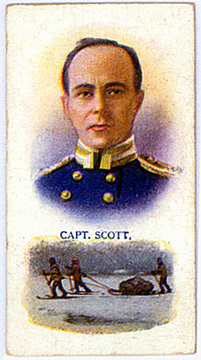 Recto: Portrait above of Scott in naval uniform. Below is a view of three men manhauling a sledge. Between the two are the words Capt. Scott.